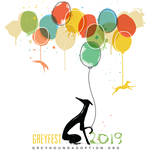 Southeastern Greyhound Adoption /Greyhound Pets of America - Atlanta (SEGA) finds good permanent homes for former racing Greyhounds. All proceeds from this site benefit SEGA's adoption program. Thank you! © All rights reserved for Southeastern Greyhound Club or the respective artist.